Make it Santa's best year yet when you leave Big-Batch Kris Kringle Cookies by the tree. 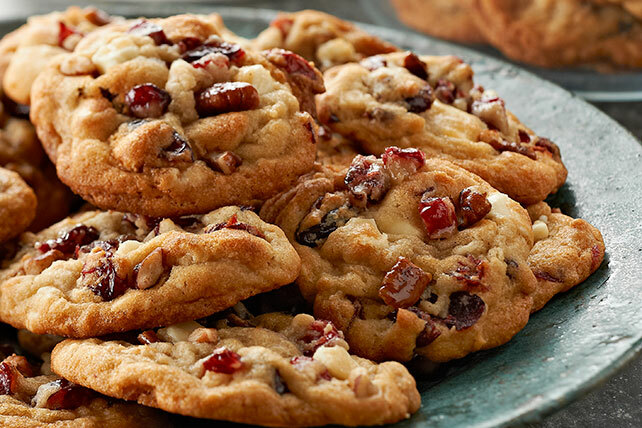 With white chocolate, dried cranberries and pecans, this Big-Batch Kris Kringle Cookies recipe is the perfect treat for the holidays. Combine flour, baking soda and salt. Beat butter and sugars in large bowl with mixer until light and fluffy. Blend in eggs and vanilla. Gradually add flour mixture, mixing well after each addition. Stir in remaining ingredients. Bake 9 to 11 min. or until lightly browned. Cool on baking sheets 3 min. Remove to wire racks; cool completely.